A warm welcome is extended to all those interested in family history and associated research. Casual visitors making use of the Group's resources and facilities are requested to make a $5.00 donation per visit. That amount will be deducted from the yearly subscription for non-menbers who wish to join the Group. Monthly meetings are held at the Marmong Point Community Hall. This building is located in George Street, Marmong Point in a park setting opposite the waterfront of Lake Macquarie. The hall has a kitchen, provision for access for disabled people and on site amenities are available. Carparking is on site and in the street. Meetings of the Lake Macquarie Family History Group are held on the third Saturday of each month except for December meetings which are held on the second Saturday. The venue is open for the use of resources from 10.00 am and meetings commence at 12.30 pm. Resources are available for use until at least 4.00 pm. The hall is also open for access to resources and research on the first Wednesday of each month from 2.00 pm to 5.00 pm or later if arranged beforehand. 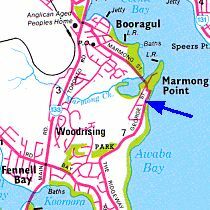 Marmong Point is located on the western side of Lake Macquarie mid way between Edgeworth and Toronto. If you are travelling south turn left at the Booragul roundabout or turn right at the Fennell Bay traffic lights if you are travelling north. People with expertise in a variety of subjects regularly attend meetings as guest speakers. Seminars and workshops are held periodically so as to provide a forum for members and visitors to expand their knowledge and expertise in respect of various resources and their individual research skills. & Traditional Owners Aboriginal Corp.
book "Iron Horse and Iron Bark"